The T-50 is a Rank I Soviet light tank with a battle rating of 2.7 (AB/RB/SB). It was introduced in during the Closed Beta Test for Ground Forces before Update 1.41. It is an effective light tank with great sloping armour and an adequate 45 mm cannon, a great vehicle for beginners getting used to the Soviet play style in higher ranks. 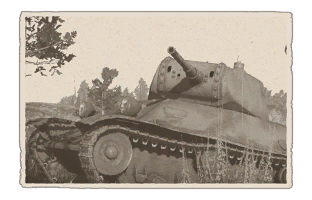 As a light tank, the T-50 is very agile and it has a very high top speed and HP ratio, due to this ratio the acceleration on the T-50 is outstanding; 60 Km/h in about 6 seconds Off-road. It mounts the same gun as the T-26, but compensates for lack of penetration with the ability to use APCR shells. It has excellent armour for a light tank and its sloping makes it very effective, especially if angled properly, though its hull cheeks are somewhat vulnerable. Use its agility coupled with the excellent armour to perform flanking maneuvers, destroy enemy tanks and retreat quickly. It is often used in tier 2 battles for its versatility as an aggressive scout tank. The armour is especially capable at stopping rounds when facing US 37 mm and German 50 mm cannons, which will bounce fairly easily even without proper angling. The gun is also excellent for a 2.7 tank, having a fairly high velocity combined with a good HE filler amount and a very fast fire rate which makes follow up/corrective shots easy and lethal. 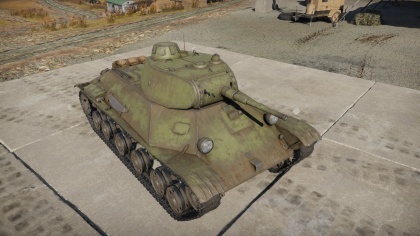 Most new tankers will quickly become used to the T-50 due to its forgiving armour, mobility, and fast-firing gun. Basically, the T-50 is a mini T-34, and should be played as such- as a close range brawler. Suspension wheels and tracks are 15 mm thick in armour. Like its big brother, the T-34, the T-50 has sloped frontal armor that can bounce most shots if angled properly. Additionally, there aren't many vital components (ammo rack, fuel tank, majority of crew, etc.) in the front. Firing at the front will, at best, knock out the driver and immobilize the tank. However, the gun will still be operational and the T-50's gun is more than capable of defeating opponents at its level. Therefore, it is best to aim for other parts of the tank. The advice for defeating a T-50 is similar to many other tanks: flank it and hit the sides. This is easier said than done, of course, as the T-50 demonstrates excellent mobility, but with the right amount of sneaking around, it can be done. Both sides of the tank contain juicy ammo racks that are hard to miss if the tank's sides are hit, but more experienced drivers will know to empty the left wall. Therefore, it is advised to fire at the right side of the tank if possible. If the right side is angled at an impenetrable angle, or if it simply is too difficult to hit, the next best target is the turret. Hitting it anywhere on the turret is likely to, upon penetration, wound if not knock out the three crew inside the turret. Combined with the T-50's subpar turret traverse, the T-50 will be in dire straits if its turret is hit. Make sure to fire at the tracks with secondary armament, if possible, to immobilize the tank so anyone could can dispatch it with leisure. Ammo racks of the T-50. Flank, flank, flank. The T-50 should be played like an up-armoured BT-5 due to its high speed and good armour. The entire Pz. III line equipped with 50 mm guns are especially deadly from the side/front, as their APHE shells combined with high velocity/firerate and fairly good armour make for difficult opponents. However, Pz.IIIs have much worse mobility and armour - take advantage of this. Decent penetration and good rate of fire. Provides a good learning curve for the later T-34 1940. Unlike the BT-tanks, the T-50 can be driven with some precision. It is easy to rush an enemy tank and catch them by surprise, giving a first shot advantage. 45mm shell has HE filler making it much more effective than the comparable shells in the US 37mms and British QF 40mm cannons. The high speed makes it easy to damage the tracks, especially the first few times driving this tank. The cannon mantlet can be easily penetrated even by starter tanks. Cramped interior, one penetration can knock out the majority of crew. The Spanish Civil War gave the Soviets insight on the future of tank warfare, and the knowledge led to an attempt to upgrade or replace their tank forces that consisted mainly of the T-26 light tanks. The development started in 1939 to create a replacement for the T-26 and BT light tanks. The prototypes created for this development were the T-126 and T-127, which were similar to a previous T-46-5 project earlier abandoned. The T-126 was selected for further development, and was to have two prototypes built and tested in Leningrad after the original design bureau was decimated by Stalin's Great Purge. The design, now finalised as the T-50 light tank, used innovative features in its introduction, using well-sloped welded armour, a torsion-bar suspension, diesel engine, a commander's cupola, and a three-man turret. It was also arranged for all of the tanks to accommodate radios. The T-50's design plan was completed by January 1941, and production was authorised after setting up in April. However, technical difficulties prevented this from happening. While its production was on standby, another tank with superior specifications was being tested and produced, which will ended up as the T-34 medium tank. Though production was planned for in 1941, the Germans launched Operation Barbarossa in June 1941, which delayed the T-50 productions as tank manufacturing lines were relocated. Tanks were being produced in the Urals and that included the T-50 light tanks, finally in production. While an excellent design, it was mechanically unreliable, expensive, and hard to produce compared to the T-34 and another light tank design, the T-60. Because of these issues, only 69 T-50s were made before production ended in January 1942. During production, two variants were made, a basic model, and an up-armoured model with extra bolted or welded metal plates. The basic model had a 37 mm frontal armour thickness, while the up-armoured version could have 57 mm thickness. Despite the low numbers, the ones available were sent to Leningrad where they saw most of their service. Some were also used in the Continuation War against Finland as the Finnish were able to capture one up-armoured version in 1944. After that, its role was largely replaced by the more numerous and capable T-34 tanks, and it was relegated to reconnaissance roles when available. Today, two T-50 tanks survive, one basic in the Kubinka Tank Museum, and the up-armoured variant in Finland at a museum in Parola. This page was last edited on 9 January 2019, at 17:43.